244 Years Later: The Willard Buttrick Powder Horn | Skinner Inc.
As a lifelong historian of the events of April 19th, 1775, I have been searching for related objects ever since I was quite young. One of those relics was the powder horn owned by Willard Buttrick, a member of Captain David Brown’s Concord Minute Company. I had read about the horn in a book published by the Town of Concord for the centennial celebration in 1875, although the printer had misspelled the name “William.” As a very important object from the fight that took place 100 years earlier, it was on display in the dinner tent for event visitors, the most distinguished being President Ulysses S. Grant. In more recent times, other objects listed in the commemorative book bore recorded locations in various historical societies and museums across the county. The Willard Buttrick horn was nowhere to be found. Last summer I received an email from a ranger at Minute Man National Historical Park saying that a member of the Buttrick family wanted to donate a powder horn to the park and wanted my opinion as to its authenticity. As I opened the images I realized it was the horn I had been trying to locate for over 30 years! The family eventually brought the powder horn to Skinner for a donation appraisal. The day they arrived was very exciting for me; finally seeing the 18th century horn and meeting the direct descendants of the man who carried it during the start of the American Revolution! 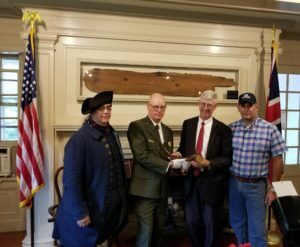 On September 15, 2018, the horn was brought to the North Bridge visitor center by the Buttrick family to be left in the care of the National Park service. As a specialist in Historic Arms & Militaria, I was invited to attend and speak about Willard Buttrick and the part he played on April 19th, as well as the ceremony in 1875. 244 years later, on Thursday April 11, 2019, the horn was placed on display in the visitors center for all to see, and in close proximity to Willard’s home, where traces of the foundation are still visible on the rise above the North Bridge. In the field of Historic Arms & Militaria, ownership and provenance play a significant role in placing items into the context of history. It is gratifying when an objects story can be told. 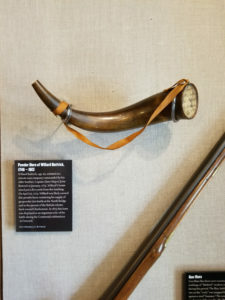 This entry was posted in Blog and tagged american history, American Revolution, antique militaria, historic arms, historic militaria, powder horn, rare militaria, revolutionary war by Joel Bohy. Bookmark the permalink.